Stuck inside again? 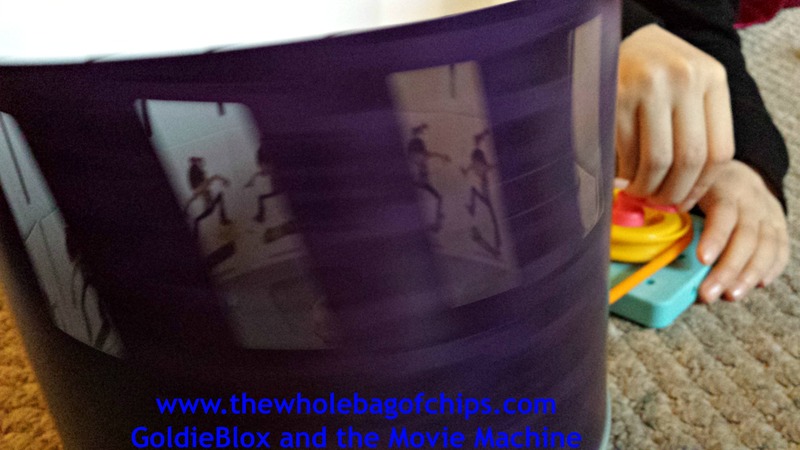 Make your own animation with the GoldieBlox Movie Maker kit! Is it snowing where you are? Since I heard a crazy statistic last night that something like 42 million people across the country were expecting snow, I’m going to guess that there is a good chance that you, like me, are watching snowflakes fall right at this very moment. It’s snowing here this morning, and I’ve begun to get very used to all these days out of school and work. Too used to them actually, and I worry for the next full week of school, which isn’t for two more weeks still. It’s going to be a harsh, harsh reality for all of us when it happens though, of that I am sure. In the meantime, this weekend we brought back all our unused batteries and unused hand, foot and body warmers from the January 25 blizzard, and instead, we bought new sleds to replace our broken ones. A good purchase, in my opinion, given that by the end of this week’s storm we will have something like 50 inches of snow in total since the middle of January. We’ve been doing fine on the days off. We haven’t been stuck inside too many days in a row, so we’re not even really going stir crazy. We’ve had enough work to do to keep us busy part of the time and enough other things to do inside to keep everyone relaxed and occupied. I work from home oftentimes no matter what the weather, so I’ve been able to basically maintain my schedule for the most part. I can’t say I’m not enjoying the less stressful weeks either. A cancellation here and there is one less thing on my crazy list of things to do, and I can’t say I hate that. It’s been a nice break. This was the GoldieBlox kit that had my daughter the most intrigued when she first heard about Goldie and all she had to offer. If you’re looking for something to occupy your kids during the days at home, especially if you have daughters like we do, I have the perfect answer for you. I recently reviewed a GoldieBlox Zipline toy and when I did, I mentioned that I had one more GoldieBlox toy to review at a later date. Welcome to my later date. 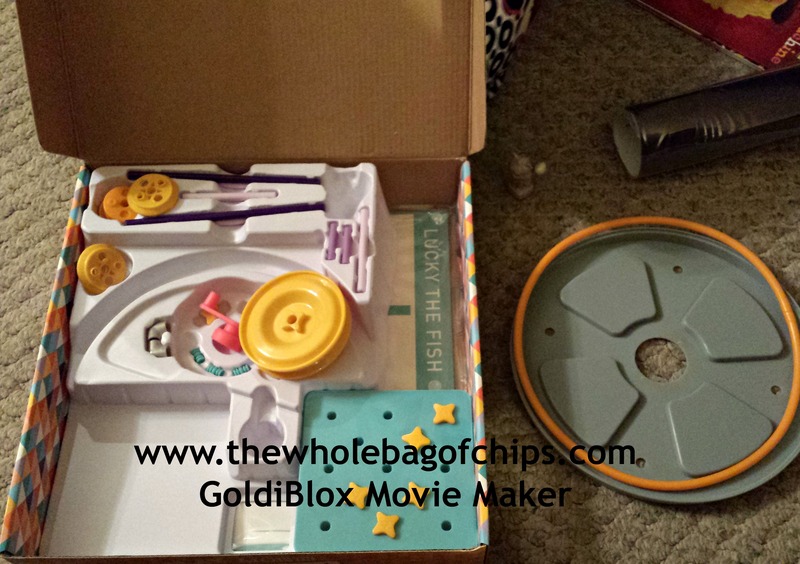 When my daughter first discovered the GoldieBlox product line, she researched them all and she was very interested in several of them, one of them being the Zipline kit, and one of them being the Movie Machine kit, pictured here. It was this kit that she used her Christmas money to buy just a few days after Christmas had passed. She was so excited to have it in hand, that the very first night we had it, she put almost the whole thing together while still wearing her winter coat. She came in the door and just got started right away. This kit combines many things my kids love: hands on STEAM activities, history, and literacy. It teaches them the history of the zoetrope, which is the very first type of animation, and teaches them step-by-step how to make their own animated movies in their own zoetrope. It’s amazing. Truly. When you watch our YouTube video showing one of the animations my daughter made that day, you might actually hear me gasp out loud. It.was.so.cool. Of course, you might also hear my youngest daughter at the end, telling me that the dog just walked through the room during the video, but that’s okay too, that’s real life. Making the video of her step-by-step animation actually shows her movie as an animated video, taking the zoetrope project even one step further, which we really enjoyed doing each time she created her animation. Our very own zoetrope! How cool is that?!?! The kit comes with everything you need to make your own zoetrope and lots of opportunities to make various animated movies, some that are provided and some ideas for creating your own. Each one is more fabulous than the next. I love that there’s “an app for that” for everything, but I also love when our kids can find out the history and the workings behind the originals for things just like this. My girls love making “Video Star” movies using an app, but I really enjoyed watching them learn about the very first type of animation and see for themselves just how to make images move. One of my favorite animations that came with the kit is the jumping animation shown in our YouTube video link, but one of my favorites that she did on her own was a clock. She made the exact same clock twelve times, moving one hour ahead each time. This kit was affordable enough that my daughter could use her own money to buy it, and it was challenging yet not at all frustrating, so she could create the zoetrope, learn about it, learn how it works and why, and create her animations and enjoy every minute. The kit comes with a box in which you can store all your parts and pieces when not in use, and the zoetrope rolls right back up for easy storage in that same box, which is great for organizational purposes. 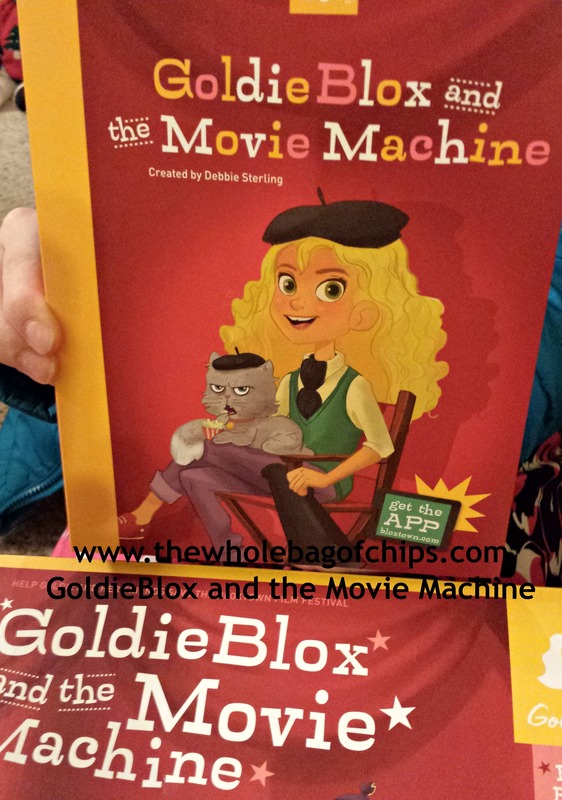 If you’re looking for something new and exciting to do on your kids’ next snow day, I’d say definitely check out the GoldieBlox product line and give their kits a try! It’ll be a nice change from being stuck inside with nothing to do but watch TV or play video games. And I guarantee, your kids won’t look at the next animated movie they see, quite the same way ever again.